We have calls daily on this so we thought it would be a great time to clear the air on how to connect aftermarket instruments to GM vehicles that have a PCM. Its easier than you think, just break down the installation in steps, no more difficult than any other gauge install. 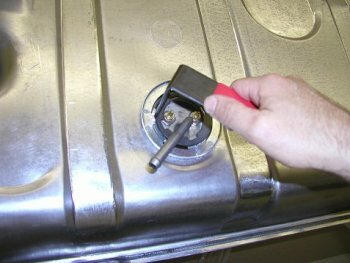 Any aftermarket gauge set is a standalone system, that means that the gauges operate alone, and are not integrated into the vehicle system as in most modern vehicles. Similar in the way most of the LS PCM/Harness installations are done, the system is standalone and does not require the body or chassis controller(s) to be intact to operate properly. If you remember this, it will make things much easier. Can't I just plug them in and everything works? Can i just plug into the CAN_BUS or OBD2 plug and I'm all set? We get These calls every day and in a world where everyone was building the exact same vehicle with the exact same engine, harness, plugs, then the answer would be yes, but hotrodding and custom vehicles are all about being different, so a "universal" approach needs to be taken to incorporating gauges into a PCM system. OBD2, CAN-BUS: Being in Detroit has its advantages, we are close to the big three and have employees from assembly to executive levels that have been employed at all three of the big names in town. We started a "plug-and-play" project with GM performance back in 2012 that lasted about 3 months. The goal was to have a direct-plug in gauge system that ran off of the GM performance PCM. Sounds great right? In reality, if everyone used the same PCM from the same year with the GMPP harness without any modifications or tuning, it would work for some of the functions. As PCM updates came out, there was no way to guarantee that the data would be read the same, or if someone say pulled an engine from a random vehicle and used the GMPP harness and gauge set, then the instruments would not operate due to the differences in the programming and addresses. We did have some success tapping directly into the GM hi speed LAN but this proved to be too difficult to install and troubleshoot for the average builder. For this reason alone the program was dropped and a universal approach was adopted. Oil Pressure: may or may not be on the OBD2, some vehicles have it, some do not. That is all that is standard across the board, some PCMs have volts and oil pressure, but not all, not to mention the fuel sender is always standalone on an aftermarket installation or retrofit. Another drawback of the OBD2 system is we found while working with GM and Mopar directly that the OBD2 interface is not designed for continuous use. During our initial testing of concept products and competitive products(OBD2 gauges, interfaces), we were not able to have 100% readings at all times without the connection being reset. SPEEDOMETER: NVU speedometers can read directly from the VSS OUTPUT from the GM PCM. ALL GM PCMs output a 4,000 PPM (pulses per mile) hall effect signal from the factory. If you have had your PCM programmed (flashed) check with your tuner to see if this has been altered. To read vehicle speed, connect the VSS output from the PCM (not the speed sender itself) to the speed sender input on the gauge. Calibrate by driving a measured mile and you are all set. You can also manually set your pulses in your speedometer to 4,000 to start off, you will most likeley need to calibrate using a measured mile to get exact speed. The 4,000 PPM count from GM is a starting point, while the PCM is out-putting this signal, GM did not know your transmission, rear end or tire size when the PCM was built so exact pulse counts will differ slightly. TACHOMETER: NVU tachometers can read directly from the PCM with the addition of a 10K-ohm pull-up resistor. It is installed between the power and tach signal. (see diagram) The pull up resistor will change the open collector to a hall effect signal aftermarket tachometers can read. All GM PCMs output a 4 cylinder open collector signal regardless of number of cylinders, gas or diesel. Set your tachometer to 4 cylinder (2 PPR) (Pulses Per Revolution). The pull up resistor does not affect the cylinder count. If your PCM has been tuned (flashed) check with the company that updated the software to be sure of what the tachometer signal is and how many cylinders and if it has been changed from stock. Below is a very basic diagram of how the install would look like for the speedometer and tachometer. Click for a larger view. Oil Pressure Can be read the old fashioned way, with a sender. The oil pressure port is metric, WE have an "LS Kit" Part number 99009-04 it will adapt the sender so metric, and included the pull-up resistor for the tach. Below is a bushing and sender installed in the LS engine. The stock sender should be retained for the PCM to monitor the pressure for its own system, remember the PCM and gauges are both being treated as standalone systems. Water Temperature is done in the same manner as oil pressure, with a new, separate sender. The gauge sender will run just the gauge, the stock water temperature sender will remain in place and feed the PCM data to run the engine. Our LS kit also has the metric bushings for the water temperature. Fuel level is done by running the fuel sender wire to the fuel gauge and is not connected to the PCM in any way on a transplant (new engine in old vehicle). Make sure the fuel gauge matches, 60s and 70s GM vehicles are 0-90 ohm. Volts are just volts and can be read from the power coming in to the gauge, no reason to make this one overlay complicated!